Bright, WXGA portable projector with advanced wireless security. 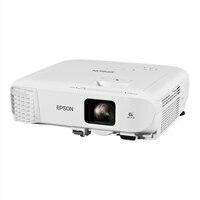 Epson PowerLite 2142W Office Projector - HD ProjectorBright, WXGA portable projector with advanced wireless security. Presenters can push content from the projector to wirelessly connected devices and control which device screens to display. Participants can make notes and send their work back to the projector. Multiple connectivity options. It is ideal for transporting between or installing in small to medium-sized spaces.